Every children’s book that brings Robin Hood to life has its own magic, and this one is no exception. It brings us an imagined glimpse of the boy Robin Hood, when he was just a young lad playing pranks with his friends. 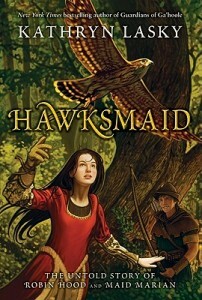 One of his friends is a young girl who is on her way to being an extraordinary falconer, unusual for girls at that time. If your young reader enjoys birds, this particular children’s book offers a glimpse into the world of falcons – various hawks, their training, behavior, and also the role they played long ago in the age of kings and queens. In fact, much of this children’s book gives us a wonderful glimpse in to the world of 12th century England, so vivid that the book deserves to be considered historical fiction, though that is not its main purpose. I love that the book portrays a heroine who is equal in importance to Robin Hood. Of course that makes the book very contemporary in its outlook, but that’s the fun of being able to take old myths and legends and rework them. This book also has a nice element of the mystical in it, with Mattie’s uncanny communication with the birds she trains. A lovely unexpected element in the story. This is a good read, exciting, filled with adventure, danger, and wonderful resolution. Great for any good reader probably age 11 and up.